In order to totally appreciate this top, you will have to wait til it is quilted and hanging outside on the line. Right now you can't really see it all. 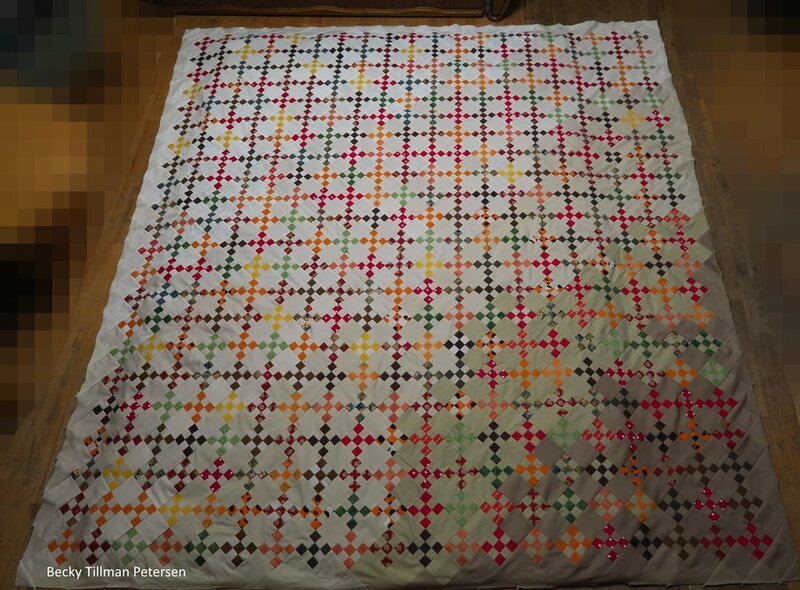 The pure white background is in the top left corner of the quilt top. Due to the angle of the photo, you can hardly tell. But I have been thinking about making this one for a couple of years now. I first thought of making this one two years ago when I made three quilts from my autumn colored upcycled fabrics. However, after finishing those I was a little tired of working with autumn colors, plus, this one intimidated me a bit. The idea was great, but I wasn't sure how to execute it. The fact that I'm limiting myself to upcycled fabrics is the rub here. It means that I have to use what I can find/buy second-hand in the form of clothing or bedding. But I used what I had and did the best I could. Hopefully you can see the idea of diffusion exemplified here. The pattern is a "how - to" and not a specific layout. Because yours will look different from mine. I was aiming for starting in the upper left corner with a white background and ending in the lower right corner with a tan background. Everything will depend on your particular number of fabrics that you use as backgrounds (I had 7 different ones) and what kind of patience you have in laying it out and the size you want. I am hoping to get this quilted while it is yet fall! Step one. Get started. Take a deep breath and take out those 9 patches and backgrounds and put them down. Sew a few row.s. Take more pictures and lay out some more rows. I darkened this picture up a bit so you could see the shades of white/off white. Getting close to getting done! Excited now because I can "feel the finish"! Be sure to check out the goodies my sis has for you. She's been stocking up on fat quarters packs. You can check out what she's got here!